Photograph: Patrick Cates Halloween in Angelino Heights. It's almost Halloween, so naturally we've been thinking about the holiday and how to celebrate. As we've been mulling around our latest costume ideas, we realized something: There is no better city to celebrate Halloween in than Los Angeles. That's right New Yorkers, we've got one more thing to hang over your head. 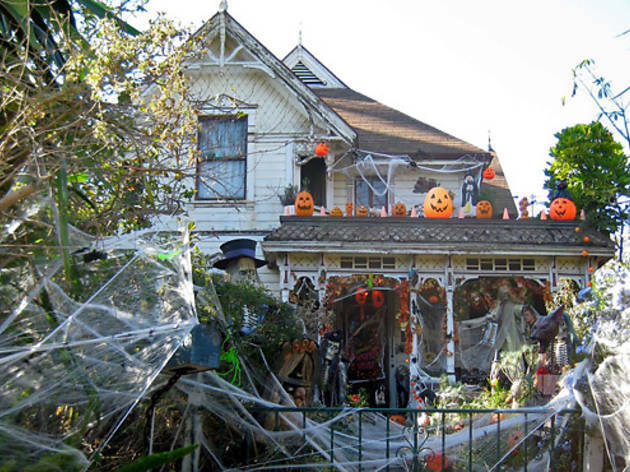 Or, rather, all of these reasons that make Halloween in L.A. the best. 1. Southern California's mild fall mean it's still warm enough in October to run around in a skimpy costume without freezing to death. 2. Our theme parks—and we have plenty of them—go all out for the holiday throughout the entire month. 3. With Hollywood here, we have set designers and props people who live all around L.A. and use their skills to go all out for their own haunted houses. 4. 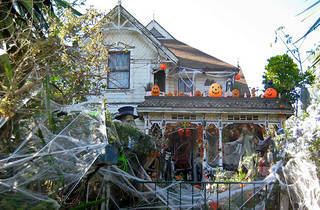 ...Or you can go to the many prop houses and costume shops across the city to create your own haunted house. 5. We have famous candy stores for the most epic Halloween candy. 6. There are plenty of truly haunted places to visit for a real scare. Our favorite? The Queen Mary. And if you're really interested, there are ghost tours available that take you to some of these haunted places for a curated, educational (and spooky) experience. 7. You can go trick or treating in Angeleno Heights and get spooked by seeing the real-life house from Michael Jackson's "Thriller" video. 8. Our cemeteries our beautiful, but during Halloween they become extra creepy with Wicked Lit and scary movie screenings. 9. There are SO many parties. 10. Like it or not, there is a not-so-glamorous side to L.A. that gives the city an extra spook factor, especially around Halloween. Have any other reasons L.A. is the best Halloween city? Let us know in the comments below.